Clinical observations and animal models provide evidence that the development of acute lung injury (ALI), a phenomenon of acute diffuse lung inflammation in critically ill patients, is influenced by genetic factors. Association studies are the main tool for exploring common genetic variations underlying ALI susceptibility and/or outcome. We aimed to assess the quality of positive genetic association studies with ALI susceptibility and/or outcome in adults in order to highlight their consistency and major limitations. We conducted a broad PubMed literature search from 1996 to June 2008 for original articles in English supporting a positive association (P ≤ 0.05) of genetic variants contributing to all-cause ALI susceptibility and/or outcome. Studies were evaluated based on current recommendations using a 10-point quality scoring system derived from 14 criteria, and the gene was considered as the unit of replication. Genes were also categorized according to biological processes using the Gene Ontology. Our search identified a total of 29 studies reporting positive findings for 16 genes involved mainly in the response to external stimulus and cell signal transduction. The genes encoding for interleukin-6, mannose-binding lectin, surfactant protein B, and angiotensin-converting enzyme were the most replicated across the studies. On average, the studies had an intermediate quality score (median of 4.62 and interquartile range of 3.33 to 6.15). Although the quality of association studies seems to have improved over the years, more and better designed studies, including the replication of previous findings, with larger sample sizes extended to population groups other than those of European descent, are needed for identifying firm genetic modifiers of ALI. Critical illness in adults often is followed by acute lung injury (ALI). ALI and its most severe form, the acute respiratory distress syndrome (ARDS), are currently defined as a phenomenon of acute diffuse lung inflammation pathologically characterized by an acute onset of non-cardiogenic pulmonary edema resulting from increased capillary-alveolar permeability. Both are clinically manifested by hypoxemia under mechanical ventilation (arterial partial pressure of oxygen/fraction of inspired oxygen [PaO2/FiO2] of less than or equal to 300 mm Hg for ALI and PaO2/FiO2 of less than or equal to 200 mm Hg for ARDS), diffuse bilateral pulmonary infiltrates on chest radiographs, and reduced lung compliance . Pneumonia and sepsis are the main and most common risk conditions associated with the development of both disorders . ALI and ARDS remain a major health problem worldwide: it has been estimated that each year in the US there are 190,600 cases of ALI, which are associated with 74,500 deaths and 3.6 million hospital days . Our understanding of the pathogenesis of ALI and ARDS has improved in recent years with the appreciation that inflammation is a fundamental component of the pathophysiology of these two clinical manifestations of the same syndrome. Clinicians have long recognized that all critically ill patients with ALI are not alike. It is becoming apparent that the diversity of clinical manifestations and the response to treatment and outcome among patients with the same disease process are influenced by genetic factors [4–6]. The first piece of evidence supporting a role for genetic differences in infection risk and outcome came from an epidemiological study reporting a strong association between death from infection in adoptees and their biological, but not adoptive, parents . For ALI, this is further strengthened by the mortality rate disparities across the different ethnic groups in the US . In addition, ALI models in inbred rodents have demonstrated differences for susceptibility and severity traits, allowing the identification of several loci and pinpointing the multigenic nature of the condition [9–11]. In our attempt to better define patients at risk, recent trends have turned our attention to the search for common genetic variation underlying ALI susceptibility and/or outcome. Based on the extensive evidence that common genetic variation with modest effects underlies susceptibility to common complex diseases  and on the impossibility of linkage analysis to detect such signals , association studies have constituted the main tool for improving our understanding of the genetic factors affecting ALI susceptibility and outcome. Association studies compare two groups of samples (cases and controls) for statistical differences in the frequency of variants at one or more sites of the genome. Although the International HapMap Project and the development of genotyping technologies have made possible the testing of more than one million of these variants in a single experiment , they have been available for a short period of time . 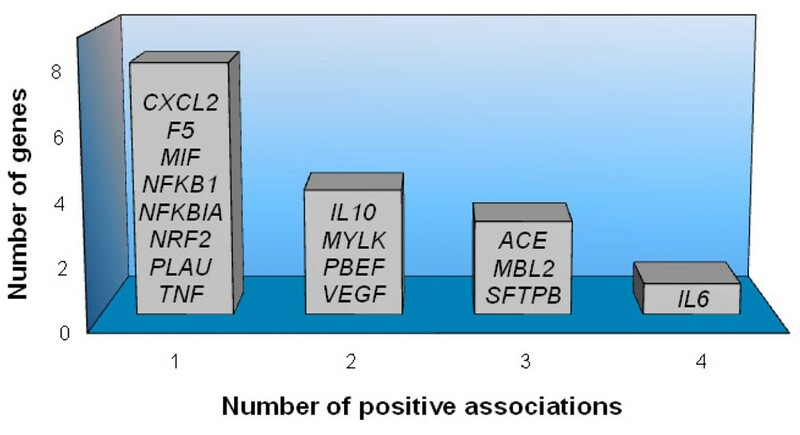 Thus, currently, association studies in ALI have exclusively used a candidate gene approach, in which one or several genes – known to be etiologically involved in the disease – are studied for relevant variant sites. In general, the inconsistency of findings across association studies  – partially attributed to inappropriate designs, implementations, and/or interpretations of studies – has motivated the formulation of standards to improve their quality and to help perform meta-analysis  under the premise that the replication of previous findings most likely reflects interesting biological processes rather than methodological quirks. Here, we aimed to examine studies reporting positive findings with all-cause ALI susceptibility and/or outcome in adults in order to evaluate their relative merits and caveats based on actual recommendations. We conducted a broad PubMed literature search from 1996 to June 2008 for original articles by querying for 'polymorphism and acute lung injury' and 'polymorphism and ARDS'. The retrieved references were then manually curated, and those reporting genetic association studies and published in English were sought. Studies were considered if a positive association (P ≤ 0.05) was reported with either susceptibility or outcomes of all-cause ALI or ARDS. Since the current tendency to perform association analysis at the individual variant level may be problematic (for example, there may be important differences in allele frequency or linkage disequilibrium [LD] structure across different populations), we instead considered the gene as the unit of replication . The Gene Ontology was used to categorize associated genes according to biological processes . Among reports with positive associations, study quality – rather than significance value – was reviewed based on current recommendations. Since performing a checklist of all issues to consider in association studies would require more than a single article, we have focused on the most relevant criteria from a checklist suggested recently . All together, 14 criteria were considered and each of them was scored as 1 if present or 0 if absent. Scoring was performed independently by two authors. Studies were divided into case-control or cohort studies based on the design in which the authors reported the positive association. If a case-control study reported a positive association with an outcome in the case series, the positive finding of the study was also considered as found in a cohort design. A final quality score was obtained by adding up scores from all criteria (see below). A reported association could have a maximum score of 14 points for case-control studies if more than one polymorphism was analyzed, a maximum of 13 points if reporting a case-control study for a single polymorphism (multiple testing adjustment not needed) or for a cohort with more than one polymorphism analyzed (definition of the control group not needed), or a maximum of 12 points for cohorts analyzing a single locus (definition of the control group and the multiple testing adjustment are not needed). To facilitate comparison across study designs, scores were then transformed to a 0- to 10-point scale. Criteria that were evaluated in relation to the study design included power calculation, characterization of cases and controls or the cohort, and whether the study considered common gene-wide variation. Power calculation was scored as present only if it was explored prospectively or retrospectively as part of the original study. Controls were considered to be adequate if obtained from the same population as cases and described in such a way that could be replicated. This criterion was not scored in the cohort studies. Adequacy of case groups was considered if demographical and clinical data were reported in sufficient detail in the text and/or a table. Mentioning accepted international guidelines for phenotype definition  as the sole description of cases was not considered to be acceptable. To cover the adequacy of exploring gene-wide variation in the association, LD must have been explored for polymorphism selection and/or for the interpretation of results. To evaluate study reproducibility, unambiguous identification of polymorphisms by means of National Center for Biotechnology Information (NCBI) reference numbers or flanking sequences was scored as present. The sole description of amplification primer pairs and/or a reference to a previous publication that reported the assay was not considered to be acceptable. The three other criteria evaluated as part of study reproducibility relate to genotyping quality control measures. Duplicate genotyping of a portion of individuals by means of the same or alternative genotyping techniques to calculate an error rate was considered to be adequate and scored as present. Testing of Hardy-Weinberg equilibrium was scored as present even when significant P values were reported for any of the groups as long as a duplicate genotyping was performed. Finally, adequate studies performed an interpretation of results blind to the clinical status of samples. To evaluate the statistical analyses, we considered the presence of multiple testing adjustments to be adequate. However, note that this category was not scored if a single polymorphism was assessed since we did not consider an adjustment for the multiple explored phenotypes or outcomes for the adequacy of the study to be necessary. Three other categories scored as adequate included an evaluation of other recorded risk factors by means of regression models, reporting major findings in terms of risks (as hazard or odds ratios) and their 95% confidence intervals (CIs), and an empirical assessment or adjustment for population stratification by means of an independent set of polymorphic markers. Finally, we scored as adequate additional support from studies performing a validation in at least a second independent sample as part of the original study. Studies designed to confirm previously associated polymorphisms were not considered to be acceptable for this category. Studies that also included experiments providing evidence of functionality for associated variant(s) were scored as adequate. The sole reference to previous publication(s) providing the functional evidence of the associated polymorphism was scored as absent. Searching for 'polymorphism and acute lung injury' or 'polymorphism and ARDS', we retrieved 53 and 23 original articles, respectively. This allowed us to identify a total of 29 articles [21–49] on 16 genes that showed a positive association with susceptibility and/or outcomes of all-cause ALI or ARDS in at least one study (Table 1). Although we used broad terms for this search, the possibility for missing additional studies with positive findings might still exist. Nevertheless, a complementary search querying for the disease name in the HuGeNet Navigator  gave completely overlapping results, showing studies for additional genes, albeit reporting negative findings. Most studies (72.3%) were carried out exclusively in populations of European descent (defined as 'Whites' or Caucasians). A minority of studies were performed in East Asians (7%) and the remaining 20.7% of studies included populations of both European and African descent. Among the 16 genes that showed a positive association in at least one study, four genes were replicated in at least a second article, three genes were replicated in at least three studies, and one gene was replicated in four studies (Figure 1). Since with only two exceptions [32, 35] none of these studies attempted to validate the association results in an independent sample, all studies were counted as a single contribution for the purpose of this assessment. Ontology analysis of these genes showed that the majority of them were involved in the response to external stimulus (56.2%) and cellular signal transduction (50%). There was also a prominent representation of genes implicated in cell proliferation (43.8%), inflammatory response (37.5%), immune response (25%), and chemotaxis (25%). Genes that showed positive association with either susceptibility and/or outcome with all-cause acute lung injury or acute respiratory distress syndrome. ACE, angiotensin-converting enzyme; CXCL2, chemokine CXC motif ligand 2; F5, coagulation factor V; IL-6, interleukin-6; IL-10, interleukin-10; MBL2, mannose-binding lectin-2; MIF, macrophage migration inhibitory factor; MYLK, myosin light-chain kinase; NFKB1, nuclear factor kappa light polypeptide gene enhancer in B cells; NFKBIA, nuclear factor kappa light polypeptide gene enhancer in B cells inhibitor alpha; NRF2, nuclear factor erythroid-derived 2 factor; PBEF, pre-B cell-enhancing factor; PLAU, plasminogen activator urokinase; SFTPB, surfactant pulmonary-associated protein B; TNF, tumor necrosis factor; VEGF, vascular endothelial growth factor. aNames are those originally reported in the corresponding reference. Ins/del, insertion-deletion polymorphism. ACE, angiotensin-converting enzyme; ALI, acute lung injury; ARDS, acute respiratory distress syndrome; CAP, community-acquired pneumonia; CXCL2, chemokine CXC motif ligand 2; F5, coagulation factor V; IL-6, interleukin-6; IL-10, interleukin-10; MBL2, mannose-binding lectin-2; MIF, macrophage migration inhibitory factor; MV, mechanical ventilation; MYLK, myosin light-chain kinase; NFKB1, nuclear factor kappa light polypeptide gene enhancer in B cells; NFKBIA, nuclear factor kappa light polypeptide gene enhancer in B cells inhibitor alpha; NRF2, nuclear factor erythroid-derived 2 factor; PBEF, pre-B cell-enhancing factor; PLAU, plasminogen activator urokinase; SARS, severe acute respiratory syndrome; SFTPB, surfactant pulmonary-associated protein B; SIRS, systemic inflammatory response syndrome; SNP, single-nucleotide polymorphism; TNF, tumor necrosis factor; TR, tandem repeat (polymorphism); VEGF, vascular endothelial growth factor. Seventeen studies (58.6%) reported positive findings using a case-control design and 12 (41.4%) using a cohort. Median sample sizes among studies were of 100 cases (interquartile range [IQR]: 85 to 212) and 200 controls (IQR: 88 to 519), whereas the median sample size for cohort studies was 183 patients (IQR: 100 to 273). Overall median quality score was 4.62 (IQR: 3.33 to 6.15) and maximum and minimum scores were 7.14 and 0.71, respectively. When studies were classified by design, the median quality score in case-controlled studies (5.38; IQR: 4.29 to 6.43) was significantly higher than in cohort studies (3.33; IQR: 2.88 to 5) (P = 0.030, Mann-Whitney U test). When studies were explored by the year of publication, there was an improvement trend of association studies over time (Spearman rho = 0.38, P = 0.041), but this was due mostly to case-controlled studies (Spearman rho = 0.70, P = 0.002) since no significant trend was observed for cohort studies (Spearman rho = 0.27, P = 0.40). Almost two thirds of the studies (62.1%) did not explore their power to detect positive findings. Nearly all studies (97%) fulfilled the internationally accepted definition criteria for ALI and ARDS , and most studies (89.7%) appropriately described demographical and clinical data from cases (Figure 2). More heterogeneity was found for the criteria to select a control group: although most studies used healthy subjects or population-based controls (43%), a great proportion of studies preferred ICU patients as controls (38%). In any case, 94.4% of studies fulfilled the required criteria to have an adequate control group. Most studies (75.9%) analyzed a few variants per gene (34.5% analyzed a single variant with anticipated functionality) without providing appropriate coverage or discussion to other untyped common variation by means of LD-based methods. Percentage of studies scored as adequate for 14 criteria (x-axis) used for the quality assessment of genetic association studies supporting susceptibility and/or outcome in acute lung injury. LD, linkage disequilibrium; pop. stratification adjust., population stratification adjustment. 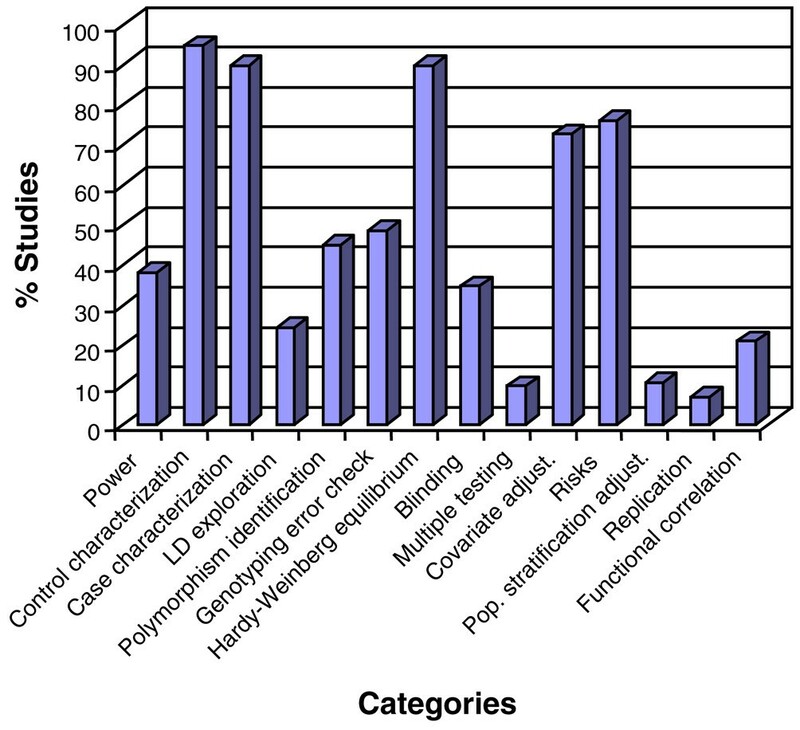 In almost half of the studies (44.8%), we were not able to identify the associated polymorphism(s) in NCBI databases straightforwardly and unambiguously since flanking sequences or genetic reference numbers were lacking. Less than half of the studies reported genotyping error checks (48.3%) or a blinding strategy (34.5%) to avoid biased results (Figure 2). However, Hardy-Weinberg equilibrium was assessed separately in cases and controls or in the cohort in 89.7% of studies. Remarkably, three of these studies reported a positive finding for polymorphisms that nominally deviated from Hardy-Weinberg expectations in control samples. Adjustments for multiple testing were lacking in most studies since only 9.5% of them made adjustments during statistical interpretation. Conversely, regression analyses to adjust for covariates were used in a high proportion of studies (72.4%). Likewise, the magnitude of effects has been appropriately reported in terms of hazard or odds ratios and their 95% CIs in most studies (75.9%). By contrast, adjustments for the underlying population stratification were nearly absent as part of the statistical toolbox of the studies (89.7%). As few as 2 studies (6.9%) supported the association in an independent validation sample [32, 35]. Only 6 of 29 studies (20.7%) explored functional significance of variants associated with disease, either by evaluating the functionality of the associated polymorphism using gene reporter assays [26, 37] or by its correlation with serum protein levels [22, 27, 43, 46]. This quality assessment of genetic association studies with positive findings in susceptibility or outcome of ALI and ARDS identified a total of 29 articles and 16 genes. Due to our limited knowledge of the pathogenesis of these conditions and given that it is likely that many common genes and pathways contribute to the onset, course, or severity of these two forms of the same disease process, for the purpose of genetic susceptibility and outcome in this systematic review, we considered ALI and ARDS as a single entity. The top gene ontologies represented in current association studies fit within the major biological processes underlying ALI development on the basis of different microarray experiments among several studies using diverse animal models of the disease and cellular models of stretch-induced injury . Overall, the paucity and quality of association data in ALI/ARDS call for more and better designed studies with larger sample sizes with unambiguous identification of the studied variants and procedures that allow monitoring of genotyping quality for a consistent replication and with better statistical analyses. Some of the reported associations, mostly in populations of European descent, have already set the bar high in the field with 'high-quality' studies, either with well-powered studies [36, 41] or with a functional correlation of the associated polymorphism . However, most of those association studies examining the functional effects of polymorphisms have reported the plasma levels of the gene product (protein) at one time point during the development or evolution of the disease process, so the role of those protein levels in the natural history of ALI or ARDS remains to be defined. Additionally, positive association studies on ALI/ARDS have focused essentially on exploring genetic risk effects of candidate gene variants in European populations. Thus, future studies must try to fill this gap by extending the association analysis to other populations that might give us an overall picture of cosmopolitan and population-specific genetic risks. This also requires authors to give a more appropriate interpretation of results in light of power estimates since genetic effects are expected to be weak and sample sizes will rarely increase to the extent considered necessary . The current evidence also encourages more replication studies, especially of those genes that have been positively associated in at least two studies . A strong candidate would be the gene encoding the pro-inflammatory cytokine interleukin-6 (IL-6). Extensive cross-species gene expression pattern comparisons in experimental models of ALI have shown that IL-6 is highly upregulated  and at increased circulating concentrations in ALI patients . However, undisputed evidence supporting the association of IL-6 gene variants with ALI/ARDS susceptibility or outcome is still lacking, even though positive results have been found in four studies. One of the major reasons is that the predicated association has been explored in a single polymorphism of the IL-6 gene (G/C at position -174 from the transcription start site). Association studies using a gene-wide coverage of common variation may reveal more robust patterns of variation associated with the disease [28, 47]. In this sense, a (nearly) full coverage of common variation of the candidate gene in association studies of ALI is especially important since no association is yet definitive and our understanding of the functional elements of our genome is incomplete . Classification and characterization of ALI/ARDS across reviewed studies were highly concordant. However, another face of the problem is that ALI/ARDS is still ill defined and the problem is further confounded by the diversity of etiological mechanisms such as sepsis, pneumonia, trauma, and massive transfusion that predispose patients to the condition. Furthermore, it has been recently shown that patients meeting current American-European Consensus Conference ARDS criteria may have highly variable levels of lung injury and outcomes . We believe that the development of novel diagnostic tools to precisely characterize the ALI and ARDS phenotypes or the risk factors underlying disease development might result in associations that are more reproducible. As a result of the progress of our understanding of this disease and the use of high-throughput methodologies , it is expected that robust well-replicated associations between genetic polymorphisms and ALI/ARDS susceptibility and outcome will become a reality in the near future. To reach this point, guidelines to report genotype data fulfilling minimum quality standards need to be implemented to improve our understanding of the genetic architecture of this disease. In addition, statistical methodologies such as multiple testing and population stratification adjustments, which to date have been almost completely absent in these studies, need to be routinely employed as well. Since all studied candidate genes await validation in independent studies using larger samples, the search for genetic variants determining susceptibility and outcome in ALI or ARDS still needs to grow and continue improving for the identification of true associations between genotype and clinical outcomes important in the care of ALI/ARDS patients. Integration of data across studies (for example, gene expression profiling, association studies, and proteomics) may reveal novel insights into ALI development which may allow us to identify cellular pathways specific to the disease. This knowledge will speed up the development of better and increasingly efficient tailored therapies for ALI/ARDS patients admitted to the intensive care unit. Current evidence suggests that acute lung injury (ALI) and its most severe form, the acute respiratory distress syndrome, are influenced by genetic factors. Association studies, the main tool for the exploration of common genetic variation underlying ALI, have thus far reported a total of 16 genes associated with ALI susceptibility and/or outcome. These genes are involved mainly in the response to external stimulus and cell signal transduction. More studies with improved designs, as well as replication of previous findings with larger sample sizes, are needed to definitely identify genetic factors predisposing patients to ALI. arterial partial pressure of oxygen. This work was supported in part by Ministerio de Ciencia (Spain) (SAF2004/06833) and FUNCIS (04/53). CF was supported by a specific agreement between Instituto de Salud Carlos III and FUNCIS (EMER07/001) under the ENCYT 2015 framework. All authors contributed equally in the assessment design and the literature search and read and approved the final manuscript.